I am one of those persons who have broken the orthodoxical boundaries in their family, and I am proud to say it. I was born and raised up in a financially unstable family, located close to Dwarka, Delhi. 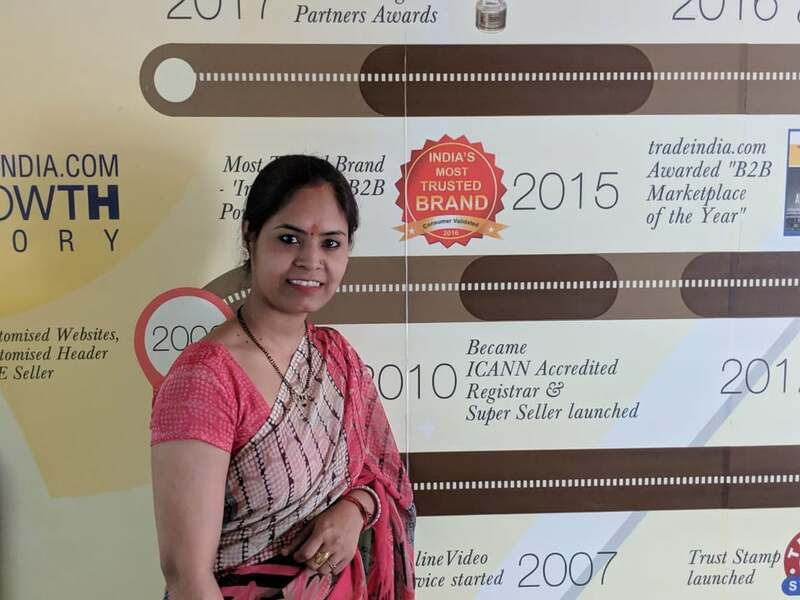 I was the first ‘girl’ in my family, who started pursuing a career by working and thus breaking every obstacle that came in the way, today, I am an Assistant Manager of Moderation Department in Tradeindia. I’m extremely thankful to Tradeindia for bringing light to my life and making it bright. It was the month of July, in the year 2007, I decided to embark the journey that entails my career. I was a fresher at that time and was aiming to have a good career with a strong company. I came to Tradeindia to give an interview with great ambitions, but my name was not shortlisted at that time, leaving me highly disappointed. After 15 days, I again got a call from Tradeindia to give a second round of interview, and hearing that made me extremely glad. Sandip Sir recognized my eagerness to work and gave me an opportunity to join the company as a Website Moderator. I decided to prove myself better than anyone in the department and bested everyone in all the tasks. Every day I had to travel a long distance, but I have always been enthusiastic to work each day because from day one I aspired to become an integral part of this booming company. As my dedication, high morale, and excellence at work got acknowledged, I was praised with early appraisal within a few months of my joining. Due to my consistent hard work and excellent performance, the company promoted me and I was given the privilege to handle a team, as a Team Leader and then as an Assistant Manager of Moderation Department. I am extremely honored to a part of Tradeindia for the past 11 years. Back in the days when I joined the company, my department used to respond to thousands of queries, and today we have reached great heights, by working in sync with Dial B2B team, the queries to which we respond these days are numbered in lakhs. Tradeindia has attained tremendous growth in the past years and to cater to millions of customers, the company has well-paid attention towards strengthening human resources. When I joined the company, there were around six or eight people handling the moderation work but today we are a team of approximately 20 people. I am thankful to Sandip Sir, Bikky Sir, Puneet Sir, Praveen Sir, Biswal Sir and my cooperative teammates for all my achievements. They have been continuously aiding me to proceed in hard times so that I can perform brilliantly for the company. Tradeindia has given me a platform to prove my excellence. Here, I have always got the freedom to share my ideas, take the decisions independently, and do the tasks employing new approaches. The foretold statement contains all those elements that have boosted my confidence and have made me a better person professionally. The company has always been employee-oriented and that is one of the main reasons behind all the success it has earned. Especially being a woman, I feel that everyone in Tradeindia focuses on our safety, and every other colleague maintains good behavior. Here, employees’ happiness is given utmost importance and performance appraisals, incentives, team-outing, movie breaks, etc. are regularly given to motivate the individuals. I cherish the time spent here at Tradeindia and in the coming years, my goal is to continue enhancing my abilities and gain more knowledge, so that I contribute even more of my efforts to this company. Really very inspiring, and definitely it will motivate all infolks. Best of Luck. Motivating Story Rinki, best of luck.